A Pennsylvania state court ruled on January 23, 2015 against the Philadelphia "School Reform Commission" on the question of whether the commission could unilaterally terminate a teacher union contract. In October, the SRC had unilaterally terminated the union's contract, claiming that the school system couldn't afford it. The union sued. Picket sign from recent demonstration in Philadelphia. 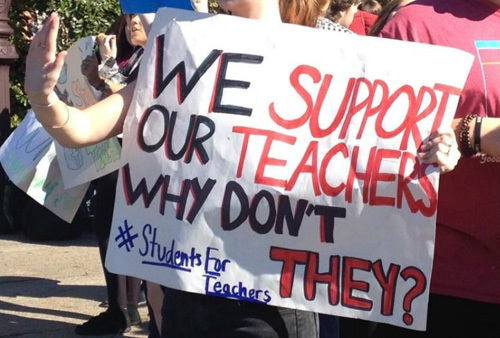 "In what the Philadelphia teachers' union is describing as "a victory for collective bargaining," the Pennsylvania Commonwealth Court ruled Thursday that the School Reform Commission (SRC) does not have the power to cancel union contracts, as it abruptly did last fall. "On October 6, 2014, the SRC voted to terminate the teachers' contract and unilaterally impose new health care provisions on the union's 10,000 members. The Philadelphia Federation of Teachers (PFT) was given no advance word of the action, which district officials said would free up an additional $50 million for severely underfunded schools. The action was set to go into effect on December 15, but the union won an injunction against the SRC. "At the time, the PFT's Caucus of Working Educators described the Commission's actions as "not really about funding. This is an attempt to dismantle the union that defends public education in Philadelphia." Student and teacher protests and walk-outs took place in the wake of the SRC's decision. "In its ruling, the court stated that "[t]he requisite authority of the SRC to cancel a [collective bargaining agreement] and unilaterally impose new terms and conditions of employment is not present in the relevant statutory provisions," unless negotiations reach a formal impasse. While contract negotiations had dragged on for nearly two years in October and the two sides were still far apart, neither party had declared a stalemate. "Absent state Supreme Court action reversing the decision, the district would be in an $80 million hole for next school year and at least that every year going forward, Green said, since fixed costs are rising more rapidly than revenue. The district already was facing a deficit of about $30 million in the next fiscal year. "School District spokesman Fernando Gallard said that if the ruling stands, the $15 million advanced to schools after the PFT contract was canceled might also have to be made up through cuts this school year. "District chairman Bill Green told the Inquirer that the SRC and its attorneys had not yet decided whether to appeal the ruling, but that some action could come next week. So far, no new face-to-face contract negotiations have been scheduled."